The Solutions 4 Office acoustics team were asked to survey a client’s sales office. The office was in a converted former executive dining area which featured lots of windows and hard surfaces. The staff occupancy and density was very high and noise had become a big issue affecting productivity of the occupying Sales Department. The client, desperately needed to improve the office acoustics. Solutions 4 Office MD, Richard Thomson, explained “one of our acoustic experts visited site to discuss the noise issues affecting the business. He took measurements of sound levels concentrating on average and peak levels over the working day. This allowed for a detailed assessment of the physics of the sound and how this affected the working practices. Noise issues are a real problem in the modern office workplace and related health issues are the second biggest reason for absenteeism. Company’s are becoming more aware of the benefits of deploying acoustic controls within offices to improve office acoustics and we are well placed to help”. In this instance, the client had some old desk mounted fabric screens that offered a limited barrier to noise transfer, but these tended to generally reflect the sound rather than absorbing it, because of their physical construction. 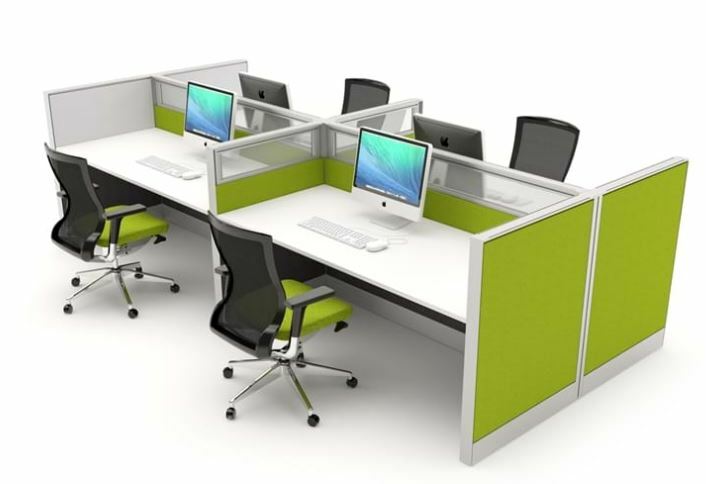 Solutions 4 Office Acoustics recommended a radical change to utilise sound absorbing desk mounted screens that are constructed with true acoustic foam and a rubber barrier technology within their core. We advised having these made to a higher height, to catch as much sound energy as possible. These improve office acoustics. Ceiling hung acoustic baffles created from recycled acoustic materials help reduce the sound waves transferring from work groups. We recommended these for this project. Manufacturing these in a choice of shapes would break up the look of the existing regimented ceiling grid, and different colors helped bring a vibrancy to the area. 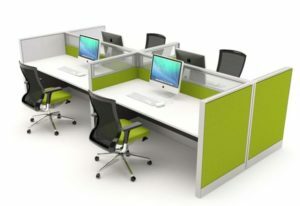 This improved the acoustics and the office aesthetics which the staff really liked. Following the implementation, the client was very pleased “we have productive sales staff in this office who are very vocal and often they had to walk away from their desk to be heard when on the telephone. The noise could be so bad that staff had to leave the office to escape the noise, so that clients could hear them. They would carry the noise into other departments, which had a knock-on effect disturbing other teams. Solutions 4 could measure our problems with sophisticated equipment and then make suggestions of how we could improve our office noise issues. We didn’t know how much technology in office design had moved on and how it could help us. Thanks to the Solutions 4 office acoustics team we have a great working office with measurable increases in productivity and reductions in absenteeism. It’s a lovely place to work now thanks to the improvement in the office acoustics”.